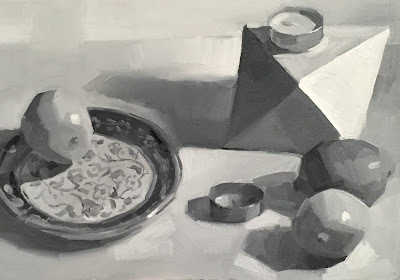 Sedwick Studio: "White Object, Lemons" Still Life, Work-In-Progress, and Black-and-White Sketch! 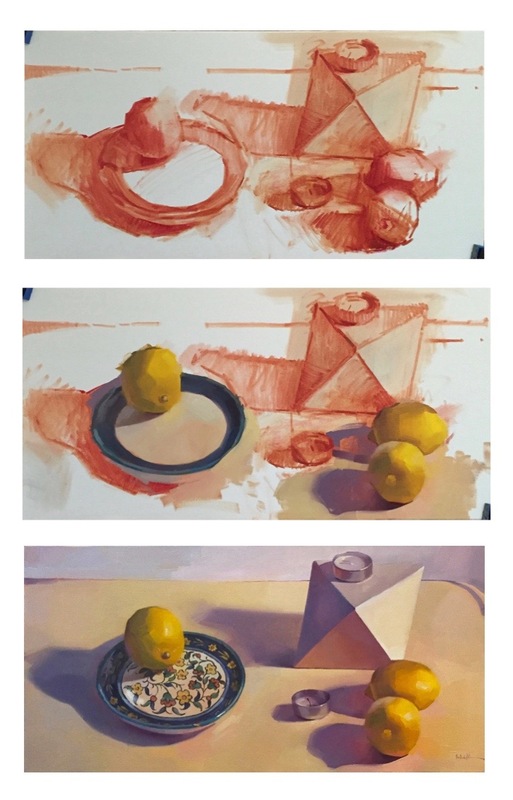 "White Object, Lemons" Still Life, Work-In-Progress, and Black-and-White Sketch! It's been a while since I painted this little plate, let's see - can I find any examples from the past to show you? Yes! It's hand-painted, which makes reproducing the design with my own hands so much more enjoyable. At one point I actually forgot I was painting on canvas. I felt like I was painting a plate myself! This twisting floral style is common to decorative pottery made in Jerusalem, where my mother bought it in 1979 - when she was pregnant with me! Can't say I remember much about the trip. Here's a progression. I didn't tone the canvas for this one, instead letting the underpainting create its own tone. The color is a neutral orange I had left over on my palette - probably a mix of alizarin, cad yellow, cad red, ultramarine blue.....you know, all the primaries. As long as there's no white in the mix, it works. ...And my black and white sketch. I love love love making these. If you're going to use Arches oil paper, I recommend brushing a thin layer of Gamsol (or your OMS of choice) onto the surface before beginning. Although this does tend to make the finished product dry at a snail's pace, it helps with the absorbent/chalky feel of the surface I've heard myself some artists complain about. Beautiful. I love seeing the progression as you developed this work.